To prevent entry and establishment, there are strict requirements for bringing honey, apiary products and beekeeping equipment into Western Australia from interstate and overseas. It is important that any suspected infestations are reported to the Department of Agriculture and Food, Western Australia's Pest and Disease Information Service (PaDIS). Early detection and eradication will help protect the Western Australian apiculture industry. 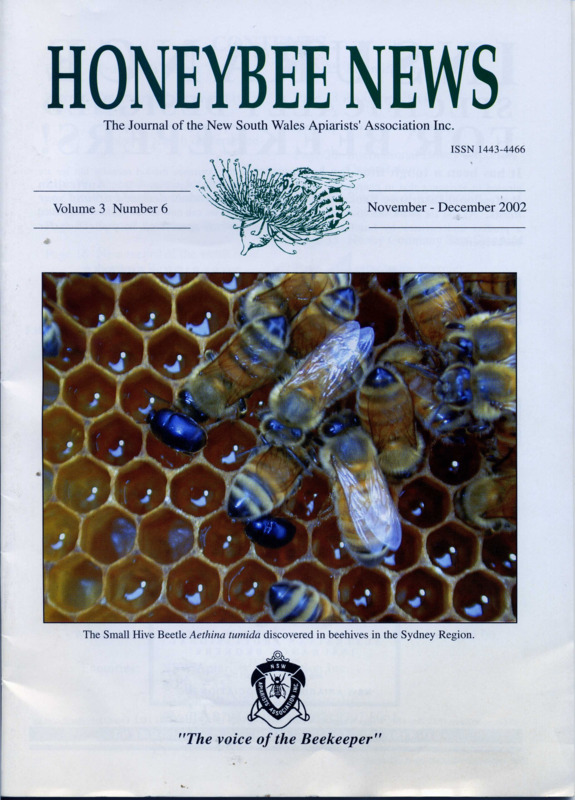 Imports of honey, apiary products and beekeeping equipment into Western Australia from interstate and overseas are strictly controlled to prevent entry of several important pests and diseases, including the small hive beetle, Aethina tumida. State legislation, which is additional to the Commonwealth legislation, prohibits the entry of all bees, honey and used beekeeping equipment into Western Australia. Only heat-treated honey is permitted into the state. The Department of Agriculture and Food, Western Australia maintains surveillance at all metropolitan and regional ports. Under legislation, surveillance reports are required from beekeepers or apiary inspectors and field staff. The small hive beetle has been discovered and confirmed in New South Wales, Victoria and Queensland. It is known to cause severe damage to bee hives. The beetle is native to South Africa and may also occur in subtropical and tropical parts of Africa. It has been found in 17 widespread locations throughout the USA and may also inhabit other temperate areas. The adults are broad, flattened beetles, about 5-7 millimetres long, and are dark brown to nearly black. The larvae are elongated, whitish grubs, which can be seen to have rows of spines on the back when viewed under magnification. Adults and larvae inhabit bee hives where they feed on stored pollen and honey. The burrowing beetles damage combs and kill the brood. As the infestation grows, the honey ferments and bubbles out of the cells, smelling like decaying oranges. Honey supers removed and stored by the beekeepers can also be infested during storage, prior to the honey being extracted. Bees abandon heavily infested hives but the larvae continue to feed on the honey. The larvae pupate in the ground and this makes control of the small hive beetle difficult. Feral bee colonies can also become infested. Control measures have so far been unsuccessful. The beetles can feed and develop normally and complete all life cycle stages on fruit such as avocado, cantaloupe (melon or cucurbit family) and grapefruit. The beetle also feeds on bananas, pineapple, grapes and mango. Used equipment or comb honey could spread the pest. The small hive beetle undergoes complete metamorphosis, passing through egg, larva, pupa and adult stages. The eggs of Aethina tumida are pearly white, 1.4mm long x 0.26mm wide, similar in appearance to honey bee eggs but two-thirds the size. Eggs are laid in irregular masses in cracks and crevices and hatch within two to four days. The larvae are the most damaging stage. Larvae grow to 10-11mm x 1.6mm long taking 10-16 days to mature. The pupae are predominately pearly white when newly formed. Pigmentation begins with transformation to adult, first in the eyes and then the wing base before encompassing the whole body. This generally lasts for three to four weeks (that is, larvae that are ready to pupate leave the hive and burrow into soil near or around the hive). However, the period spent in the soil varies greatly from 15 to 60 days. Larvae entering the soil make a smooth-walled earthen cell to pupate. A newly matured adult is light, yellowish brown and becomes brown, dark brown and finally black at full maturity. This change takes place during pupation and when brown or black adults are emerging from the ground. During the first day or two after emergence young beetles are active, take flight readily and move towards light. As they mature they become less active and keep to less illuminated portions of the bee colony. Adults are also covered with fine hair, which makes handling difficult. Adult beetles have a life expectancy of up to six months and will survive for five days without food and water. The small hive beetle may be spread between colonies and apiaries when bees, package bees, used hive components and hives are moved during normal management. Hive components may provide hiding places for adults. Combs containing honey and brood, or empty combs being moved to and from honey extraction premises are also a means of spreading the beetle, particularly those that contain pollen. The movement of soil is an effective means of spreading the pupae stage of the small hive beetle from one district to another. Movement of beeswax capping, bee-collected pollen and comb honey could transmit immature life cycle stages. Larvae tunnel through comb with stored honey or pollen, damaging or destroying capping and comb. Larvae defaecate in honey which becomes discoloured. Activity of the larvae causes fermentation and froth in the honey. This develops a characteristic odour of decaying oranges. Damage and fermentation causes honey to run out of combs, creating a mess in hives or extracting rooms. Heavy infestations lead to bees abandoning their hive which may cause a rapid collapse of even strong colonies. Largest infestations are normally found in and near honey houses. Colonies can quickly collapse after beekeepers have united them with other highly infested supers. Numerous larvae burrowing and tunnelling in brood and honeycomb cells should be seen. Adult beetles may not be easily observed. Honey may weep from comb where cell walls and caps have been pierced by the activities of the larvae. The colour of honey may darken due to contamination of faeces deposited by the larvae. Fermentation and frothing of honey in hives or in combs of honey stored in honey houses with an odour similar to decaying oranges are typical signs of infestation. Fermented honey may drip and collect on the hive bottom board or the honey house floor. Trails of fermented honey will be left on the floor by larvae that crawl from stored honey super boxes as they try to reach the soil to pupate. When a hive is opened, the adult beetles usually run quickly from the combs and hide in the darker areas, especially the rear of the bottom board. Remove the lid and place it on the ground upside down. Place the super box on top of the lid and leave it for about a minute. Lift the super off the lid and look for the beetles. Beetles will move quickly away from the light when the hive lid is opened. If no beetles are seen, remove brood combs one at a time, examine all surfaces and place each frame outside the hive. Continue until all frames have been examined and the brood chamber is empty. Examine the floor of the brood chamber, looking at the back or rear corners of the bottom board where the beetles hide from the light. If the bottom is not attached, remove the brood chamber and examine the bottom board. The beetles will tend to move quickly from the light. Beetles can be picked up using fine-tipped tweezers or your fingers. Place them in a sealed container until dead. Check the super boxes and frames for infested larvae, particularly those that have been removed for extraction. Adult beetles can be found in debris surrounding the hive floor or in dark areas. During cooler temperatures beetles can be found in the honey bee clusters. Beekeepers should constantly monitor their operations for presence of the beetle. Detection is relatively easy. Practise cleanliness around the honey house. Leave filled supers standing only a short time before extraction. Beetles may rapidly build up in stored honey, especially where honey has been stored over pollen. Exercise care when stacking infested equipment or extracted supers onto strong colonies. Beekeepers doing this before the beetle is identified may inadvertently deat a deathblow to healthy colonies by providing space for the beetles to build up that the bees can not protect. Pay close attention when supering colonies, making splits or exchanging combs; all these activities could provide room for the beetle to become established away from the cluster of protective bees. Monitor colonies for hygienic behaviour; are the bees actively attempting to rid themselves of both larval and adult beetle. If not, replace them. Experiment with traps in an attempt to keep larvae from reaching the soil where they complete their development. Try moving bees from place to place. Adult beetles can fly, but their range is not known with certainty. Some areas may be much more hospitable to beetles due to local soil conditions than others. When the number of small hive beetle larvae reaches a certain level in a colony, honey bee brood rearing stops. Adult beetles appear to be eating bee eggs and may even consume their own eggs. Larval cannibalism is also reported. Amber light shone on frames at night will cause adult beetles to move and be detected. Adult beetles do not get caught on sticky boards, and move quickly across them. Adult beetles will lay eggs on fruit, but this does not appear to be their preferred diet. The best survey technique is carefully examining the frass on bottom boards and/or cardboard inserts, with one side removed and the exposed corrugated portion in contact with the bottom board. The beetles apparently are drawn to this material and easily hide in the corrugations. This has now been integrated with use of coumaphos-impregnated plastic strips. It is important that any suspect infestations are reported. Early detection and eradication will help protect the Western Australian apiculture industry. Please contact the Pest and Disease Information Service (PaDIS) to report this pest.